Homelessness is a major social issue in Canada which the government has introduced initiatives to combat. Over the last two decades, homelessness in Canada has grown. Since the year 1997, homelessness in Canada has grown by both intricacy and size. No longer a crisis only experienced in large urban centers like Toronto, Vancouver, Montreal Calgary, it has also gained prevalence in the suburbs. The demography of Canada's homeless population is also changing. By the late 20th century, there were reports that a vast majority of homeless persons were represented by men, but lately fastest growing subgroup of people who are homeless are men and children, followed by youths. Recently, homelessness has become a major social issue in Canada, resulting in a dedication from the federal government of $120 million every year from April 2014 to April 2019 to renew its Homelessness Partnering Strategy (HPS). The main agenda is to focus on the Housing First model as a first step in dealing with the issue of Homelessness. Therefore both public and private organizations across the country are qualified to get subsidies to implement the Housing First programs. Who is Considered to be Homeless? An individual or family is considered homeless if they do not have stable, appropriate or permanent housing and lack the immediate prospect or the means and ability to acquire a home. Homelessness is complicated, and can be a result of societal barriers, racism and discrimination, the lack of appropriate and affordable housing, lack of finances and physical or mental health challenges. Most people do not choose to be homeless as it is a stressful and unpleasant experience that happens due to challenging circumstances. Where are High Amounts of Homelessness Found in Canada? 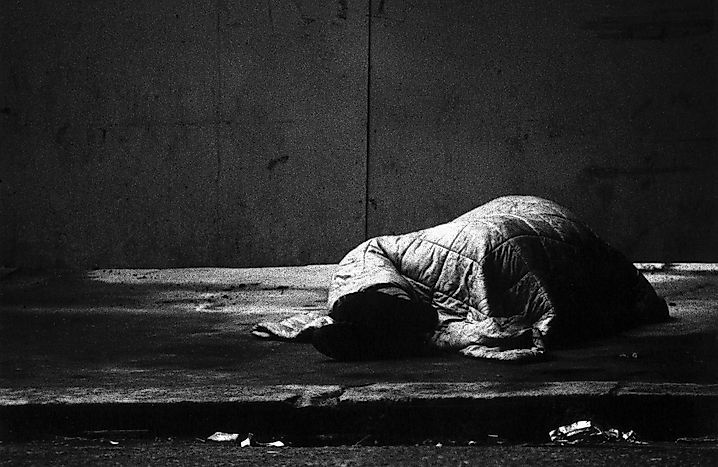 The number of homeless persons is estimated to be around 200,000 per year with 30,000 per given night. At least one out of every 230 Canadians spends a night in a shelter home. Toronto is the Canadian city with the highest number of homeless persons followed by Calgary, Edmonton, and Vancouver. However, regarding high rates of homelessness per capita, Red Deer is the leading followed by Calgary, Vancouver, Edmonton, Kelowna, and Toronto. What is the Canadian Government Doing to Help the Homeless? Addressing the issue of homelessness in all of Canada has been a challenge to the country's federal government. The government aims at ending homelessness by providing renewed funding to Homelessness Partnering Funding (HPS) and effectively advocating and emphasizing on the Housing First programs. The HPS initiative is a five-year project expected to run from 2014-2019 with $700 million in funding. Every renewable year the project is given a sum of $120 million for the implementation of the programs. About 60 communities in Canada are benefiting from the HPS project while 80% of the funding goes to the ten biggest cities in the country. In Canada, homelessness acquired its proper name after the 1960s when it was officially defined as the unhoused as compared to living in houses that are of poor quality. Homelessness remained a minor factor because of the availability of affordable accommodation found in the poorest parts of most big cities. However, during the 1980s the issue of homelessness plummeted before accelerating in the 1990s. Cities such as Toronto increased the number of admission to homeless shelters by 75% from 1988-1998. The Canadian Homelessness Research Network (CHRN) and the National Alliance to End Homelessness compiled the first Canadian national report card on homelessness in 2013.